The Scouts are in position at the back of the parade and ready to go. It’s a cold, damp day as most Remembrance Days seem to be but the Scouts will stay warm and dry with matching anoraks, wool berets and gloves. A pause in the parade. Here’s a panorama photo showing our position in the ceremony. To our left are other West Vancouver Scouts and Guides. At the far end in matching blue rain ponchos are the Girl Guides. Between us and the Guides are the other West Van Scouts in attendance. The final march past the review stand. 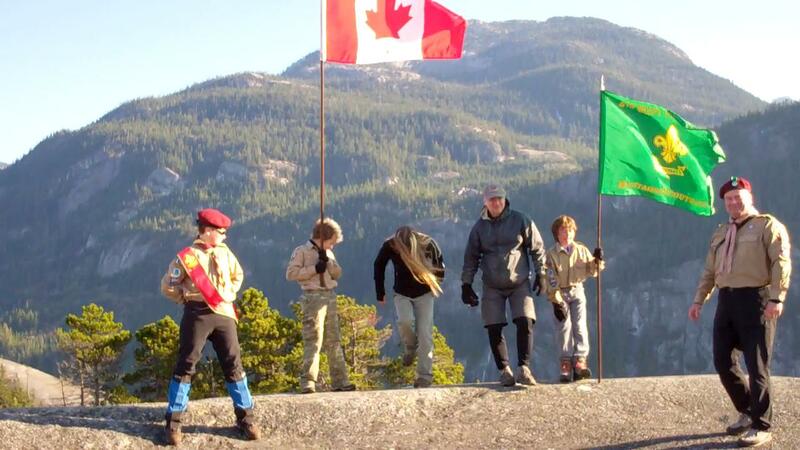 This year we held our Investiture Ceremony of our two new Scouts on the second peak of the Stawamus Chief! As we approach Squamish on a bitterly cold morning, the sun is just starting to hit the Chief. In the distance, the Garibaldi Massif stands out without any cloud coverage for the first time in weeks. Now we just have to get from here to way up high there…. First there’s a whole bunch of these…. And then a whole lot of this…. And a whole heck of a lot of this stuff…. And a few route choices to be made….. On this sign the arrows pointing up are very appropriate. Back into the pre-historic forest to finish the hike upwards. The path becomes much more interesting. Chains bolted to the rock help us ascend this part of the wall. A little gap in the path to be jumped and then we begin to ascend the narrow, more vertical sections with chains. Single-file from here on up! Hikers going down have to be patient and wait for their chance to descend the chained sections since it’s one-at-a-time only. Ladders bolted into the walls help us get past the most difficult sections. We’re out of the tricky bit and on our way to the summit. Scouter Alan is pleased to be finally out in the sun and able to enjoy the fantastic views that now open up all around him. Finally, we ascend the last ridge up to the summit! Looking south across at the first peak of the Chief (the location of last year’s Investiture Ceremony). Despite the bitterly cold wind, I had to ask the Scouts to remove their gloves so they could hold the flag and salute with their bare hands. Reciting the Scout Law and Promise 2,100 feet up over Howe Sound in beautiful British Columbia. The older generation watches with approval as a younger generation starts his life as a Scout. Welcome to Scouting Tripp and Keir! You might also like this…. Before the two new Scouts could be called forward for investiture in our Troop, we first had to perform a ceremony with their parents.You might like this one…. We call it “Busting the Bubblewrap”. With their sons at their sides holding the flags, I asked the parents if they were prepared for their sons to join our Troop. I told them that they would have to acknowledge their acceptance of the challenges that such membership would entail for for their boys. When they responded in the affirmative, I called upon the senior Patrol Leader to “present the bubblewrap”. He put an 8 inch square piece of bubblewrap (1 inch sized bubbles) at the feet of each parent. I then called upon the parents to “Bust the Bubblewrap” to signal their willingness for their boys to become Mountaineer Scouts. The two parents then stomped out every bubble at their feet. It was hilarious and the Scouts and parents loved it. Thanks Robin and Jay for being real sports! Go full screen and increase the resolution to at least 720p for best viewing.